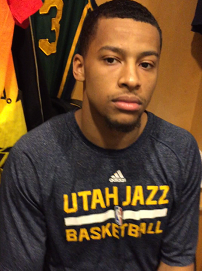 Quinne Lowe of Sports Q&A was able to catch up with former University of Michigan star and current Utah Jazz point guard Trey Burke who was in Dallas to take on the Mavericks. Burke gave insight on the adjustment between his first and second season in the NBA and what he needs to do in order to be a better player going forward. He also talked about how important returning to Michigan his sophomore season, making the national title game run in 2013 and playing under Wolverines head coach John Beilein has been in the development of his game on the professional level.